Ghosn's "resignation isn't a subject of discussion at this stage," according to Budget Minister Francois Baroin, who is also the government's official spokesman. 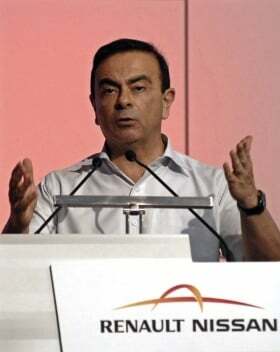 PARIS (Bloomberg) -- Renault SA CEO Carlos Ghosn, forced to apologize publicly to three managers he wrongly accused of spying, faces "consequences" from the French government for the automaker's bungled espionage probe. "There will have to be consequences for the incredible amateurism and lack of dignity in the accusations made against these men," Budget Minister Francois Baroin said Tuesday. The government, Renault's biggest shareholder, "cannot just let this pass," he said. Ghosn, who also heads alliance partner Nissan Motor Co., is contending with dual crises after the espionage case he personally oversaw unraveled and Japan was devastated by last week's earthquake, halting production at six Nissan plants. The CEO plans to travel to Japan March 17 to oversee Nissan's recovery operations, a person familiar with his schedule said, declining to be identified because the plans are private. Renault on Monday offered to reinstate and compensate three executives after police discredited the carmaker's claims that they received payments from Chinese companies through overseas bank accounts. Renault shares have dropped 14 percent this year, compared with an 8.5 percent decline in the 14-member Stoxx 600 Automobile & Parts Index. Nissan stock has declined 10 percent in the same period. As the espionage case began to disintegrate earlier this month, pressure mounted on Ghosn, who defended the spying claims by saying in a January French television interview he had "multiple" findings to support them. Ghosn on Monday retracted the allegations and pledged to forego his 1.6 million-euro ($2.23 million) bonus and stock options. Ghosn's "resignation isn't a subject of discussion at this stage," Baroin, who is also the government's official spokesman, said on LCI television. The case against the three fired executives was based on verbal information obtained by security manager Dominique Gevrey from an undisclosed source, for which Renault had paid more than 300,000 euros, Paris Chief Prosecutor Jean-Claude Marin said Monday. Gevrey has been jailed to face charges of "organized fraud." His attorney Jean-Paul Baduel did not return calls and messages seeking comment. COO Patrick Pelata and other executives involved in the mishandled internal probe will also hand back their 2010 bonuses and receive no stock options this year, the company said. The government, which owns a 15 percent stake in Renault, still expects the automaker to "get to the bottom of who was responsible" for the bungled case, Industry Minister Eric Besson said Tuesday. "It's a good thing that the Renault chief executive has apologized publicly," Besson said on RTL radio. "This isn't the end of the matter internally." Ghosn will head to Japan to oversee Nissan's recovery from the earthquake that has halted factories and threatened supply lines. Nissan, Japan's second-largest carmaker, suspended operations at four plants until today and at two other plants until March 18, the Yokohama-based company said on Monday. Nissan may lose 2 billion yen ($25 million) for each day of lost operations in Japan, Goldman Sachs Group Inc. estimated. Renault fired upstream development chief Michel Balthazard, his subordinate Bertrand Rochette and deputy electric-car program chief Matthieu Tenenbaum in January after accusing them of espionage. Balthazard, who has ruled out returning to work, may meet with Ghosn and Pelata today before the CEO flies to Tokyo, said a person with knowledge of the matter, who declined to be identified because the matter is confidential. Renault spokeswoman Caroline De Gezelle declined to comment.